All the stars aligned when the Royal Ballet ballerina was catapulted onto the Broadway stage to play Lise in An American in Paris. Christopher Wheeldon’s stage adaptation of the beloved Gene Kelly film won 4 Tony Awards, enjoyed a successful run in London’s West End and will be one of the very few musicals to now be screened to cinemas worldwide. For Leanne, the role has changed her life. London Calling: It is quite unusual that a musical puts dance so firmly at the centre of the story telling. Leanne Cope: I think that’s one of our unique selling points really! LC: You were a proper classical ballerina when Christopher approached you for this show. Did you ever dream of being in a musical? LC: Musicals were pretty much my first introduction to theatre. I didn’t see a ballet until I went to the Royal Ballet School. Really, I’d grown up on musicals. They were always my first love and I always had that battle within myself over whether I wanted to go to musical theatre college or stick with the ballet. There was always that push-pull within my heart and my mind. I think I made the right decision in sticking with ballet because I think if I’d gone to musical theatre college, my ballet technique would have never been strong enough for this role. So I got really lucky that I got the best of both worlds. LC: But it is usually scary for dancers to open their mouth and speak or sing on stage. LC; Yes, it is scary. But I think it’s something that I now wish would be introduced into ballet schools, because knowing how to express yourself through words makes it easier to express yourself through your body. But yes, being miked the first time was scary and singing especially was so scary! But now it is something that I feel I don’t want to go back on, I definitely want to carry on making a noise on stage. LC: You met the legendary Leslie Carron who played Lise opposite Gene Kelly in 1951. How was that? LC: Amazing. Initially we opened the show in Paris for our out of town tryout, so between Paris and Broadway, I came back to London for a month to rest and to see friends and family, and I bumped into her totally by accident at the Royal Opera House. I was there to watch my husband perform and she happened to be watching the show as well. We were sat literally one behind another and I introduced myself. And that initiated a bit of a friendship. We met for tea a couple of days later and she came up to New York to see the show and she also came to opening night here in London. LC: I think that Lise, your character, is actually the one that was changed the most from the film. When you revisit the film, she is quite giggly and sugary whereas in the musical version Lise has a lot more depth. LC: I guess so. In general, the whole film is more sugary, it was post war, MGM couldn’t make a true picture of what life was like in Paris after the occupation. From the way they depict it, every soldier stayed behind panting pictures in Montmartre and meeting beautiful French girls and there was no clue toward the kind of trauma the these men had gone through and no talk of the occupation in the movie. The difference between the movie and our show is that we brought the action forward, closer to the occupation so everyone’s life is painted a bit more by that, everyone has a darker side to them and secrets. Especially the introduction of the Jewish note to Lise, which isn’t in the film at all. LC: What was it like bringing that show to Paris, the city it depicts? LC: We were all quite nervous because it was the beginning of the journey and the first audience we were going to introduce it to. Playing in Paris, we wanted to get it right, we wanted the show to represent Paris in a good light and they really appreciated it, we felt it. We had a sold out house every night, eight standing ovations or something ridiculous! For me the scary thing was playing a Parisian woman in Paris. There is only a couple of French characters in the story, the rest are American, so I had to really try and work on the French side of things. I used to sit outside in cafes and just watch these beautiful French women and try and figure out what it was that made them so unique. LC: Paris to me now is … my heart, really. Paris has changed my life with this show. I feel such a connection to Paris now and between Broadway and opening in the West End I came home for a two month break and my husband had three days off work and said ‘Let’s get away, where do you want to go?’ And I said Paris! I really wanted to go back and revisit it. I’d never been to Paris before this show, and now Paris is really one of my favourite places in the world. LC: What is next for you? LC: It’s very strange being a freelance performer now, I always used to have a job. I went from the Royal Ballet School straight into the company and stayed there 12 years. And I spend the last three and a half years on this American in Paris journey. Now, suddenly I don’t have a definite future. I want to move more into the acting rather than dancing. I guess if I would still be with the Royal Ballet I’d be thinking about finishing my dance career soon anyway. So it’s nice that I’ve had this transition into a different type of theatre. I am hoping that I can now call myself an actress and do some more theatre work and after the filming of this show it would be great to do some screen acting as well. 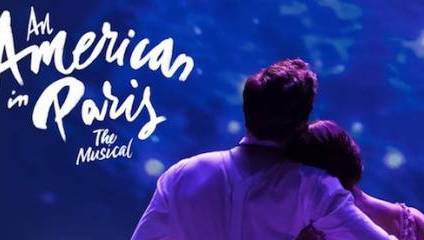 An American in Paris - The Musical will be screenings in cinemas around the country on 16 May for one night only. Tickets are now on sale. Find your local screening at anamericaninpariscinema.com.